Polenta: Lightly grease a glass or ceramic 8-inch square or 9-inch round baking dish. In a heavy saucepan, heat water to boiling. Add salt; gradually sprinkle in cornmeal, wisking constantly to avoid lumps. Reduce heat to low and place pot on a heat diffuser. Cook, stirring often with a wooden spoon, until polenta is thick yet still smooth, 20 to 30 minutes. Stir in corn; cook 5 minutes; set aside until cool and solid, about 30 minutes. Pepper sauce: Add oil to skillet over medium heat. Add onion, sauté about 2 minutes. Stir in garlic and poblano peppers. Gradually add bell peppers; sauté until tender, about 5 minutes. Stir in coriander and cumin; cook, stirring, about 30 seconds. Add stock and beans. Heat; add salt. Preheat grill or broiler. 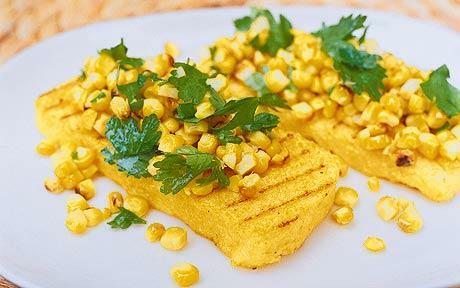 Cut polenta into wedges or squares. Arrange on a greased baking sheet; brush with olive oil. Grill or broil, turning once, until light brown on both sides. Serve immediately, topped with sauce and cilantro. Toast the cornmeal lightly in a heavy skillet for a nuttier flavor.